Audi A5 8T Coupé BJ Convertible: 11-16 rear diffuser s-line look. This product page has been automatically translated. If you have any questions, do not hesitate to contact us. 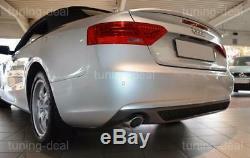 Audi a5 8T coupe / cabrio facelift rear diffuser s-line look. Audi a5 convertible rear facelift look diffuser s-line (only suitable for standard bumper with einfachendrohr left + right) fits on standard - bumper by year from 2012 to 2016; not suitable for s-line, s5 or rs5 rear bumper! New, unpainted and painted in high quality fiberglass (fiber composite glass) excellent surface structure allows for convenient painting. The goods can be picked up and paid on site by appointment. Shipping with gls within 1-2 working days after receiving the payment. The tracking of the shipment is possible via the tracking number each time. The item "audi a5 8t coupé bj 11-16 rear diffuser s-line look" is on sale since Tuesday, March 5, 2019. It is in the category "auto, motorcycle parts, accessories \ tuning, styling \ bodywork, outside \ bumper.
" The seller is "tuning-deal" and is located in / in Hamburg. This item can be shipped to the following countries: european union, switzerland.